This is a short extension to my last article on Why The Earth Is Cooling. When I first began exploring Modtran, the numbers it produced for downward radiation at the surface seemed to make no sense. It nearly always produced the same number, and I thought that part of the program was broken. On reflection, it became clear that the numbers were correct and that I had fallen into the warmist trap of believing that CO2 really does something to the Greenhouse effect. When the numbers in the very low humidities were charted, all became clear. 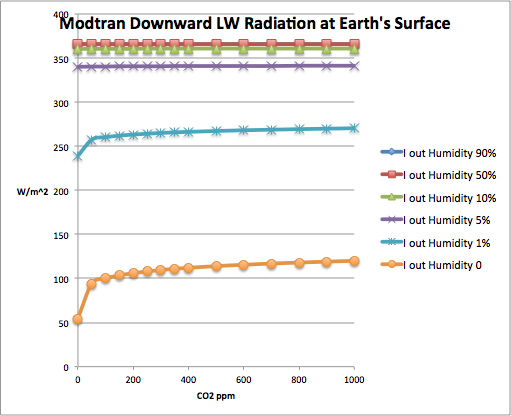 Here is what Modtran says about downward or “back” radiation at the Earth’s surface for values of humidity from 0 to 90% and CO2 from 0 to 1000 ppm. You should notice that the legend cites six traces, but you see only four. That is because the 10, 50, and 90% humidity traces are superimposed. There is very little change in the downward radiation for any humidity from 10% and above and for any CO2 concentration from zero to 1000 ppm, or indeed for any concentration of CO2 up to 10,000 ppm. As you can see, only in the driest desert on Earth will increasing CO2 increase the “back” radiation. Water vapor is by far the strongest greenhouse gas, but it is nearly saturated at 10% humidity. At 10% humidity and above, no amount of CO2 does anything. Most of the humidity on Earth is in that area on the right where doubling CO2 will do nothing to increase the long-wave radiation from the sky. Yet another warmist fail. Unless the entire planet very soon goes to zero-percent relative humidity, we can go ahead and shut down the global warming hoax industry. If it’s happening, it is hardly because of CO2. Why is atmospheric science at the Air Force different from that at GISS, CRU or PIK? If Modtran were wrong, IR seeking missiles wouldn’t find their targets. One warmist who always used Modtran for his arguments was ScienceOfDoom. Seems too simple and obvious. They can’t be such idiots. So even in an atmosphere where water is a trace gas and CO2 is totally dominant at 96 %, H2O “provides a substantive input”. Intriguing. There is no greenhouse effect, of increasing temperature with increasing carbon dioxide, all the way up to 965,000 ppm (the Venus atmosphere is 96.5% CO2). I already showed the definitive evidence against the greenhouse effect, back in Novembe 2010, with my Venus/Earth temperatures comparison. I also pointed out, a month earlier, that the radiative transfer theory, as applied in climate science, leads immediately to a gross violation of conservation of energy, because in the radiative transfer theory as used by climate scientists, the planetary surface is wrongly assumed to radiate as a blackbody (390 W/m^2 at 288K, the global mean surface temperature, and that is much larger than the mean solar intensity of 242 W/m^2). I have not bothered to get into the radiative transfer theory, beyond those simple facts, because I already know there is no greenhouse effect global warming. My Venus/Earth comparison also shows the atmosphere is warmed by direct absorption of incident solar radiation, not from the surface as the “consensus” of scientists–both warmist and skeptic–firmly believes (the tropospheres of both Venus and Earth, in fact, over the range of Earth pressures, are warmed by the same fraction of the incident solar energy, so that the ratio of their temperatures is a constant, and just that predicted from the ratio of their distances from the Sun, nothing else.) The Venus/Earth comparison is the definitive evidence for the correction of climate science. And it should have been done 20 years ago, when the Venus data was obtained, and the greenhouse effect should have been dropped from science then–if there had been any competent climate scientists working in the field, either then or any time since. That my comparison is still ignored and/or dismissed by virtually everyone on both sides of the climate debate, is a stunning indictment of physical science today. The on line version of MODTRAN won’t run Venus, because there is no pressure entry. But I did run it with 96% CO2 and got 276.6 w/m^2, so there seems to be a definite greenhouse effect. It would be much greater at Venus with the higher pressure and higher insolation. If Venus had even a little water, it would be much hotter. Just for grins, I put in -100 km to raise the pressure and raised the surface temperature to 600 C to simulate Venus. MODTRAN said the downward radiation would be 5507 W/m^2! No wonder it’s hot! Is your scale too small to detect changes that are important? Isn’t a doubling of CO2 suppose to increase the DWIR by only 3.7 w/m2? I would like to see a scale where values this small would be apparent. Ed shows the numbers under the graph. Look at the rows for 500 and 800 ppm and compare them. Only in very dry conditions does CO2 doubling effect changes beyond a Watt. It is known that the IR absorption spectrum of CO2 is largely cannibalized by H2O. This has been a skeptic argument for years. Good to see that MODTRAN agrees. Look at the table of values. For any humidity value over 10%, there is no change at all for changing CO2. MODTRAN’s resolution is about one part in 1000. That would be about 0.3 W/m^2. Thanks Ed. That does answer my question. It looks like the 3.7 w/m2 is only relevant at 1% humidity. Is that absolute humidity? Or, relative humidity? I have my doubts. The reason I asked is I have serious doubts that both climate scientists and skeptics could have missed something so big. It doesn’t make sense on the surface. The water vapor content in ppm is generally less than 5%. That would mean the only valid part of the graph would be the lower values. And, these values correspond more closely to the 3.7 w/m2 that is advertised for a doubling of CO2. However, it could still be an interesting topic to research. We know that water constitutes about 75% of the surface. If the water vapor ppm is much higher there then the GHE change for CO2 will be negligible. If the CO2 GHE is only over land and only makes a difference in dry areas, then an argument could be made that the real effect is much less than climate models predict. In addition, one would need to understand the 2 and 3 dimensional aspects to truly understand the issue. For example, if the lower atmosphere has a much higher ppm, then all the IR will be absorbed there. We know the upper troposphere (and above) has very little water vapor but if none of the pertinent radiation makes it that far then is won’t matter. However, if models use the average of the entire atmosphere they would not see this situation. In addition, that average would be lower making CO2 look more impressive. horizontally as huge swirling plumes, often originating in the tropics and moving into higher latitudes. A typical water vapor plume is thousands of kilometers long and several hundred kilometers wide. Plumes supply moisture to hurricanes, clusters of thunderstorms, and winter storms. The water vapor content in the charts is 0 to 90% Relative humidity, not ppm. Your bias is showing. Did you look at your results to see if they actually made sense before spreading this nonsense around the globe? Your calculations show that at 10% humidity and greater, DLR amounts to about 440 W/m2. If the atmosphere near the surface were a blackbody with emissivity equal to 1, T = (W/o)^(1/4) = 297 degK = 24 degC, or about 10 degC hotter than the average surface of the planet (which radiates about 390 W/m2). Since about 10% of surface thermal radiation escapes to space, the emissivity of the atmosphere might be around 0.9. This would raise the average temperature of the atmosphere near the surface to 305 degK or 32 degC. You obviously a mistake somewhere. Some calculators let you choose tropical, temperate, or polar regions for these calculations. Perhaps you accidently used a tropical one. Several sources have shown that the increase in DLR for 2X CO2 is only about 1 W/m2 at the surface for an average terrestrial location. This result is smaller than the 3.7 W/m2 calculated at the tropopause because there is much more water vapor near the surface. Most of the CO2 absorption is at wavelengths that are essentially opaque due to water vapor near the surface. The small (1 W/m2) surface forcing from 2X CO2 IS a weak point in the AGW argument. I used 1976 US Standard atmosphere. You can run the numbers yourself. The site is here. Frank, you are accusing someone of spreading nonsense, then you are not able to tell where he made a mistake? Only that he “obviously” made a mistake? And then you go on confirming that the increase in backradiation by CO2 is smaller than a Watt? Let’s all hold our breath, waiting for Frank’s answer! At least he recognized the worldwide reach of notrickszone! There are other possible problems with averaging. I’ve seen a picture of the IR spectra of the earth. I suspect that is an average. Is the spectra of oceans the same as land? Is desert the same as forests or snow and ice? Are corn fields the same as urban areas? If not we could be missing important situations. Let’s say the spectrum over oceans contains a high value for the frequencies that are absorbed by CO2. However, we know the oceans will be more humid and hence more likely to be saturated. Therefore, increases in CO2 concentration will not have any effect. Likewise, if desert areas or snow and ice had a lower distribution of CO2 absorb-able radiation we would also see a lower impact. By averaging the radiation spectra these types of considerations would be completely missed. I don’t know if there is much variation in the radiation spectra but I would like to know if this has been studied. There is the HITRAN database where IR spectra have been recorded during the ascent of weather balloons. Ferenc Miskolczi worked for NASA and had the task of creating models or theories for the transparency of planetary atmospheres including the Earth, so he used the HITRAN observations, and came up with a description. Unfortunately, his theory says that an increase in CO2 will, for energetic reasons, be compensated by a resulting decrease in average water vapor content. So it was not useful for the warmists at NASA and he fell out with his NASA boss. It is not possible to use relative humidity as input to the interactive Modtran program used here. That is a misunderstanding. The relative humidity profile is part of the atmospheric model that is used in Modtran and what you can do is to modify that profile by using a scale factor. To use values of 10 – 90 for that scale factor produces vastly unphysical water vapor profiles without any meaning. Realistic scale factor values should be not much more than one. Unfortunately the text is in Swedish but the figures at the end of the blog post should be sufficient to understand this issue. They have a translator, and so you can pretty much get the jist of it. The interface in the tool I am using is different from the one pictured in that post. I know that they way I am using it is correct because I can duplicate known spectra. Article on that coming soon. Which version of Modtran are you using and may it be used in a similar way from a hyperlink? But is the translator working? Following the discussion of Modtrankörningar in the comments below, then perhaps the following figures of interest. They illustrate how to run Modtranprogrammet discussed. The site where Modtran documented for an example of simulation is compared with the satellite IRIS actual observations over the Sahara. This diagram shows the top of Figure 3 below. The chart that appears at the bottom of the same figure is my running Modtran from the interactive website. Figure 4 provides the input data for this run. Atmosphere model is Tropical jordytetemperaturen be 322 C, 325 ppm of carbon dioxide, vattenångprofilen be scaled down to 50% of the initial profile of the relative humidity in the atmosphere of the model. All this has been inserted by selecting the input data shown in the upper part of Figure 4. The lower part of Figure 4, we extract from the output file. This confirms that the temperature at 0 km is 322 K. The rightmost column gives the relative humidity in percentage as a function of height. If we run the program with a scaling factor of water vapor equal to unity instead of 0.5, we get twice as high values ​​of the relative humidities in the troposphere, consider yourself happy. I think this example should be completely clear how this interactive Modtran on the Web should be run. The effect of CO2 is on the reduction of the heat leaving the upper atmophere. The quoted number is about 3.71 Wm-2 for 2 times CO2. Using HITRAM 8, I get about 2.8 Wm-2 by moving out to 100 KM instead at the top of the tropopause. This loss of heat radiated causes the atmosphere to warm which reducs the heat transferred from the surface. The back radiation will increase because the lower atmosphere will become warmer, not because the CO2 increases there. The factor climate scientists miss is that latent heat transferred to the atmosphere increases rapidly (6%/C) with the surface temperature. The warming from cloud formation increases heat loss to space and is thus a large negative feedback factor, reducing climate sensitivity . See my two papers on ClimateClash.com . In above, tropopause should be troposhere. The tropopause begins at the top of the troposphere, the place where the temperature stops dropping with altitude and begins to warm. Some of the CO2 effect near 15 microns occures here, so increases in the emission altitude actually increases radiation. This explains why my result is considerably less than the usuall 3.71 Wm-2. People need to graduate from the old 20th century “School of ThoughT’ to the 21st century new paradigm shift in climate change science.